From the beginning do-it-yourselfer to the advanced woodworker, you’ll find information and inspiration to make your built-in projects successful. Whether you want to install a few shelves, organize a closet, install a ready-made cabinet, or build your own doors and drawers for a custom entertainment center, you’ll discover the tools and techniques to get the job done right. 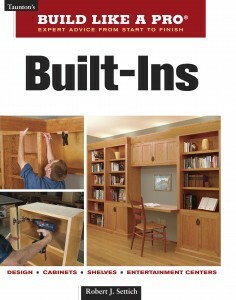 This book gives you a results-oriented perspective on built-ins. You’ll start by focusing on function, and then learn—step by easy step—how to design, build, and install a solution. In addition, you’ll discover smart ways to use stock cabinets to achieve a custom-made look. Along the way, you’ll see how to conquer real-world challenges such as out-of-plumb walls, out-of-square corners, and wavy walls, floors, and ceilings. You’ll encounter these problems in every home, especially older houses. Each book is autographed by the author: “Best Wishes, Robert J. Settich” If you prefer an unsigned copy or want a personalized inscription, please specify in the Comments section of the order form. Of course, personalized books are not returnable.